Universal or Model-Specific Car Seat Covers? Keeping your seats looking fresh is one of the biggest challenges of owning a car, especially if it’s your every day ride. However, it’s also one of the best ways to keep your car’s interior comfortable and looking good. Luckily, the best car seat covers can help you define your look and keep your ride comfortable and classy. Sorting out the best car seat covers from so so ones can be a real challenge, though. To do it, you need to look at what makes a given car seat cover great overall and what specific things you personally are looking for in the best car seat covers. This article is here to help you find the best car seat covers, and save money by getting the right covers at the right price the first time, without having to try out dozens of different products yourself. While I’m going to go into a lot more detail later on in the article, this table is here to serve as a quick and handy reference guide while you look for the best car seat covers for your ride. This right here is a nice seat cover protector for your car so when you get done with your workouts and you’re all sweaty or dirty. You don’t get any of that on your car seats. This will block it. It absorbs sweat. It’s antibacterial and you can machine wash it so it will be ready for your next workout. Now let’s take a look at this. We have a simple three step installation process. You can shield your car seat from sweat or dirt, cool your body down after a workout, breathable, odor free gel, guaranteed, machine washable material, bacteria resistant technology, one step installation, and silicone non-slip grip. Now this feels really soft and padded. It’s a really padded seat cover so that is great. It’s going to make a really comfortable ride home from the gym. You now, when you’re all sore and need some comfort. I have black, but It comes in five colors. Simple instructions and everything is all included right here. Let’s see. Place your Iso Towel on your car seat with the logo facing up and the non slip technology down. Stretch the cord of Iso Towel over the top section of your seat and tighten until snug. Simple, okay. We recommend you put it on before the workout. Obviously, because who wants to put it on after the workout? Nobody. It’s machine washable. Wash separately with cold water for the first time and the cords can be tied to both. The bottom does have the non slip grip material. It has this weird feeling to it. I don’t know what it is. I guess because it’s rubberized. It has a bunch of rubber dots. So, yeah, definitely this won’t be slipping off your seat. We got two headrests, and then we’ve got the full body. The headrest part, completely black, and then the actual seat cover part has the Sojoy logo right here. It’s 100% polyester, and the back is silicone drop anti-slip fabric, and it’s filled with foam, wash by hand and wash by machine. That’s on nice and tight. Okay, perfect fit. Nice and padded too. Feels soft, way softer than the regular one that came with the car. It feels nice and soft and it actually matches the interior too, black on black on black. They have different colors depending on your car. Okay, feels good. Adds some extra padding to the seats. This actually makes the car more comfortable, so even if you’re not using these for the gym, use them just to get some more comfort in your car. I’m moving around. They’re not moving at all. I’m impressed. These are actually staying in place. I’ve had some other seat covers that don’t stay in place so it’s good that this has the non slip material on the bottom. I highly recommend them if you guys go to the gym and want to keep the nasty germs, dirt and sweat out of your car because, go look up how dirty gyms are. You probably won’t go back. Practical, comfy seat covers. Good quality. 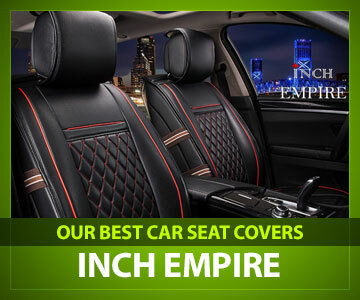 This comfortable, supple PU leather offering from Inch Empire includes a full five-seat set: two front bucket seat covers, as well as a backbench and rear backrest cover set. Although the price is fairly high, the inclusion of all these components makes this an excellent value. Let’s start with the good stuff: these are nice looking, nice feeling seat covers. The PU leather material is also extremely easy to clean, and the soft suede backing provides soft protection for your vehicle’s seats. These car seat covers are even machine washable, which makes cleanup much easier. While the completeness of the set and the inclusion of suede drive up the price a little bit, these are also major benefits. Even at a higher price point, getting this complete set is likely cheaper than buying similar seat covers separately. One of the standout features is the grid design, which provides extra cushion and gives these car seat covers a classy, sophisticated look. Of course, in addition to the cushion that these provide, the seat covers also include an additional 3 millimeters of cushioning inside. The grid pattern and the overall construction of the fabric also make for very high breathability. This is great because it keeps you cool while you’re riding, while still affording plenty of protection to the seats below. One of the few notable flaws I noticed was the relative complexity of installation. While it’s still possible to get the install done in a pretty short timeframe, there is a little bit of extra work involved, especially if your backseat includes headrests. All in all, I’d recommend these to anyone looking for some of the best car seat covers for true luxury users who want to impart a sense of sophisticated style to their car while also increasing seats’ comfort and durability, especially in the hotter months. This sporty full car seat cover set from PIC Auto boasts a lot of subtle but very cool features in addition to its racer inspired look and packs plenty of value in terms of overall quality as well. One of the most innovative and impressive features on this product is its simple but highly adaptable zipper system on the back bench cover, which allows for operation of fold-out armrests and cup holders included in the backseats of many newer and luxury vehicles. The zipper system increases its value by allows for different split bench configurations as well, making this one of the most truly universal sets on the market when it comes to backseat covers. Of course, the two front bucket seats have plenty to offer as well. The material of the whole set is easy to clean and extremely soft to the touch. One of my favorite things I discovered upon installing and testing this set in my Nissan was its blend of leather and mesh materials. The mesh provides greatly enhanced breathability, which is perfect for those of you who live in hot climates. It also looks really cool, especially since it’s available in a wide variety of colors that all contrast nicely with the black of the leather sections, which gives this set a more sports car friendly look. That being said, there is a slight downside to the mesh construction that’s worth noting, even though it might not be a deal breaker for most of you. The mesh sections are a bit harder to clean and less durable than the leather sections. They’ll still protect your seat, and this car seat cover set will still last longer than most on the market with regular and careful use. However, it is something to consider! Overall, I would recommend this to anyone looking to protect their seats, enhance their comfort, and/or jazz up their interior with a sportier look while on a budget. While there are certainly cheaper options out there, this is by far the most affordable among the best car seat covers for the entire interior. The set’s high compatibility also makes it great for virtually any car! Clocks in at an extremely low price point for a full set of car seat covers, without sacrificing quality or attention to detail and extra features. The innovative zippered design on the back bench cover allows for a wide variety of changeable configurations to support existing armrests, fold out cup holders, and split benches. Mesh in seat covers allows for maximum breathability without sacrificing the give and bounce you expect from a truly thick, luxurious cushioned car seat cover. While the mesh has a ton of benefits, it is slightly harder to clean and less durable than a pure leather design would be. However, it all comes down to taste: the material is still quite durable and washable, and it offers enhanced breathability and a cool, sporty aesthetic that you may want. This simple but powerful set of products from manufacturer and retailer Big Ant offers high quality and some surprising features while still installing in minutes and making itself available at once of the lowest price points around. This set includes two bottom cushions for the front seat. Their universal compatibility and simple design make them fit virtually to any set of seats, and their high durability makes them a great choice for protecting your seat from heat damage, spills, and whatever else you encounter out on the open road. AAnti-slipcoated rubber mat on the bottom to prevent sliding. Durable plastic chucks to slide through the gap between seat and backrest. Strong but gentle metal hooks to hitch the cushion cover under the seat. However, one of the most interesting and innovative features on this set has nothing to do with its cushioning or protection abilities. Both pieces in this set include a handy front pocket that’s perfect for storing small items so that they won’t get lost but remain easily accessible. While I thought these pockets were little more than a slightly cool afterthought upon first unboxing the set, once I got these seats installed (in just minutes, by the way) I found myself using the pockets all the time. They’re a great place to stow a wallet and/or phone while in motion. Of course, the major downside to this set is that it does not offer any protection for the backrest of your front seats. That being said, I’d strongly recommend this to anyone who wants a highly breathable, heat insulated, and overall very comfortable cushion that’ll also help prevent damage to the seat bottom from heat or spills. I’d also highly recommend it to anyone looking to make the most of limited storage space in their vehicle. One of the simplest car seat cover sets on the market to install–takes just a few minutes for most users. The inclusion of the extremely handy front pocket for storage of the wallet, phone, or other items that are easily lost but also need to remain accessible at all times while riding. Available in three neutral but beautiful colors, which are sure to complement virtually any car interior. Innovative engineering provides both maximum cushion and maximum breathability while also enhancing security by not letting the units move around. Minimalist, compact design favors increasing comfort and the durability of the seat over protecting the backrest or providing a major aesthetic change. This complete set of car seat covers from respected auto accessory manufacturer FH Group is available at a price that simply can’t be beat. While it lacks the special features of some other more expensive models, it strives for simplicity and basic high-quality standards at a great price instead. The flat fabric design with a black base color and a wide variety of designs featuring bold stripes and other enhancements are sure to fit with virtually any aesthetic. Whether you want your call to feel sporty, purely luxurious, or striking and fun, there’s sure to be something to suit your taste here. Fortunately, it’s not all about the looks. The material is also a great feature of this set of car seat covers. Its breathable polyester construction is great for hot weather and preventing cracking and other types of damage that can be caused by heat. The flat polyester fabric is a bit more difficult to spot clean than leather models, but the whole set is machine washable, which mitigates this difficulty almost entirely. That being said, there is one drawback to the material and this set’s minimalist construction: it’s quite difficult to install. On the other hand, full seat covers are rarely extremely easy to install, and this truly universal and deeply adaptable set will fit almost any car interior. I would recommend this product to anyone who wants high performance on a very tight budget. I’d also strongly recommend it to those of you who live in extremely hot climates and want maximum breathability as a result. Available at an extremely low price point, especially considering that it’s a full five car seat cover set. 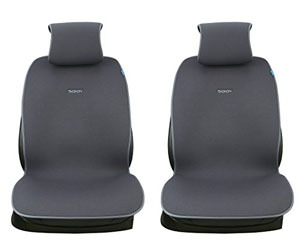 Polyester fabric base makes this one of the most breathable and cooling sets of car seat covers on the market, and the equally breathable internal cushioning only boosts the comfort factor further. Available in a wide variety of designs sure to suit any aesthetic taste from the minimal to the bold and bright. This is one of the more difficult sets on the market to install, though for the price and how well they stay in place after a proper installation, they may just be worth the extra effort. More difficult to spot clean than leather models, though the fact that the set is machine washable helps to offset this a great deal. While this seat cover lacks a backrest cover, it owns that minimalist design and makes up for it with a wide variety of features. On top of that, there’s a seamless upgrade available for this model that includes a backrest cover as well. The extreme simplicity of the installation of this unit makes it one of the best car seat covers around, and it’s also available at a steal of a price. Of course, it’s not just value and simplicity that defines this product. Boldness and variety are also important, as this unit is available in a wide variety of colors and designs made to either blend perfectly into your existing interior or contrast boldly with it for more of a pop of color effect. On top of that, the variety extends even further. In addition to the aforementioned upgrade models, there is a backseat cover model available as well, meaning it’s easy to create a set from these individual units. This unit also boasts complete compatibility with side impact airbags, making it a strong contender for anyone whose list of concerns is topped with safety first and foremost. While one of the biggest concerns facing car seat cover users is the complexity of integrating them with built-in safety systems, that’s simply not a concern here. Provides protection for the existing seat. Enhances the comfort of the driver with cushion and breathability. Enhances the aesthetic appeal of the vehicle’s interior. It’s also widely compatible with virtually any four-door sedan or SUV model available on the market today. I’d recommend this unit to anyone looking for a simple but effective car seat cover that boasts maximum comfort and extremely easy installation at a steal of a price. Available at an extremely budget-friendly price point, this unit also boasts extremely simple and quick installation. Maximum cushioning and breathability greatly enhance driver comfort. The variety of options means that you’re really in control of exactly how this unit works functionally and aesthetically with the rest of your car. Not as feature rich as some more expensive similar products, though some users will doubtlessly appreciate the simplicity. Finding and buying the best car seat covers available on the market today isn’t easy. Here’s some information to make sure you make the right decision the first time, saving you money and keeping your ride looking fresh and coordinated to your personality. This is one of the most important decisions you have to make before you can even properly start looking for a set of the best car seat covers to suit your needs: do you want covers that protect and cushion the entire seat, or just the bottom portion? There isn’t a single right answer to this question. Like so much else when it comes to your ride, this decision comes down to your personal tastes and preferences as well as your budget. Generally speaking, a simple cushion that covers the bottom of the seat runs a bit cheaper, because they are simpler and use less material. They’re not only a choice reserved for when you’re on a tight budget, though–that savings can let you get a truly luxury item at a more middle of the road price. Seat cushion covers that only cover the lower portion of the car seat also have less of an impact on the overall look of your car (an advantage if you have really nice looking seats already) and are generally more truly universal than full seat covers. They can also be useful for covering up a hole, burn, or tear that only affects the lower portion of the car seat. However, car seat covers that sit on top of the entire seat have their advantages, too. While they tend to run at a bit higher price, they’re still not out of reach for most consumers. If the back of your seat is difficult to clean, a cover can protect it from spilled drinks and road dust. When you suffer from back problems, having some extra cushioning on the upper portion of the seat as well as the lower may help. If the back of your seat is damaged or often gets hot, the cover can protect both your seat and your back if it expands over the whole seat. As always, there are a lot of considerations to make. Think about them carefully, but ultimately you’ll need to choose what’s best for you personally. It is your car, after all! Another big consideration to make is whether you want to cover all your seats, just the two front seats, just the backseat, or just the driver’s seat. Also, if you plan to cover all the seats, how important to you is it that everything matches? If you plan to completely cover the full backseat and both front seats, getting a matching set may be the cheapest way to get the job done. It will also give your car’s interior a more unified look, as all the seats can match. Many drivers also choose to simply add seat cushion covers to the backseat, while applying full seat covers to the front seat. This is because the front seat is used most often, and because the front seat has the most sun exposure–which can lead to the seat cracking, and of course can be highly uncomfortable on hot days. There are plenty of options out there for how to cover up your car’s seats. Here’s a table with some of the most common options and their advantages and disadvantages. Complete coverage for all seats – Gives the interior a completely unified look. – Affords all parts of all seats equally complete protection. – Most expensive option (usually). – Full back seat covers are often more difficult to install, especially if you have a folding backseat. 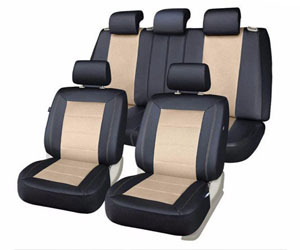 Full coverage of front seats, cushion covers in the back – Differences between front and back seat are usually unobtrusive. – Provides plenty of comfort and protection for the backseat without a lot of additional expense, and leaves more room in the budget to focus on the front. – Won’t give the same completely unified look as full seat covers for both front and back. Front seat coverage only – Because this costs quite a bit less, you can go for a very luxurious option even if your budget isn’t wide open–and you can always add backseat covers later. – If your seat covers don’t match the look of the existing car seats, can be quite jarring aesthetically. Driver’s seat coverage only – Much cheaper and provides a wide range of options, especially if you generally use your car alone. – Can create the biggest problems with mismatched materials, especially with a full car seat cover. Of course, what you do is completely up to you. Your car, your call. The color and material of your car seat covers say a lot about you and your personality. At the same time, they can also have a big impact on the comfort of your ride. Most car seat covers feature some kind of leather or a vegan or imitation leather material. The leather is a great material because it’s both resilient and soft. However, the bad thing about leather is that it retains a lot of heat. This is especially prevalent with black leather. While black leather may just be the nicest looking material available for car seats, it can burn your bum if you’re not careful. If you want a black or dark brown leather for your car seat covers, there are a couple ways you can get this great looking material to stay cool and comfortable even in direct sunlight in the hotter months. One option is to use some kind of reflector or sun shade for your car–just don’t forget to put it up whenever you park in the sun! In addition to keeping your seats comfortable, this will keep the overall temperature of your car’s interior low, which is good both for your comfort and health and for the longevity of everything else in the cabin. You can also get seats that integrate some kind of fabric or mesh with the leather material. I’ll have a bit more on this later. Before that, though, let’s discuss one of the other major advantages of leather: it’s easy to clean. While stains often set into fabric seats immediately, it takes a lot more to permanently stain leather. It holds up better to most cleansers than plastics, but it’s also easy to simply clean with water. Plenty of car seat covers either use all cloth or mesh materials or, more frequently, integrate these materials into a leather seat cover. For example, the PIC Auto option discussed in this article uses mesh for most of the areas where your skin or clothing will touch the seat, but leather elsewhere for aesthetics and ease of cleaning. Mesh often looks really cool, too, and can give your car a sporty look. It also doesn’t retain anywhere near as much heat as leather. Beware, though, as it’s generally a lot harder to clean! In addition to the material used in your car seat cover, you’ll also want to consider the color. The color may just have the biggest impact on the way your car’s interior looks. It also affects your interior’s heat retention. Light colors tend to give your car a more vintage luxury feel, while blacks and espresso browns emphasize a modern, functional, but still comfortable aesthetic. Bright colors tend to give your car a lot of energy but may also clash more with other hardware. Darker colors also absorb more light, and therefore heat, from the sun. If you usually park in a garage, this won’t be as big a consideration as you, but if you have a driveway at home and parking lot at work, you’ll either need to go for a lighter color, use breathable mesh, and/or invest in a windshield reflector. Of course, the breathability of a fabric tends to have a lot more of an effect on whether or not a given set of car seat covers retains too much heat than the color alone does. Although leather is the best material in many other ways, it may be the worst on this front because of its solidity. Fabric and mesh tend to work a bit better when it comes to maximizing airflow, though certain design innovations like grid design allow the same breathability with all the luxury of leather (and also look really good to boot). Here’s another big challenge that often comes up when you’re trying to decide on the best car seat covers for your needs: should you go with a universal seat cover or one designed specifically for your model? Generally, I almost always recommend going with universal seat covers. Ten or fifteen years ago, I might’ve told you exactly the opposite, but with increasing standardization of car interiors and adaptable car seat adjustment technology, it’s truly much better now to get a universal model when you can. There are two main reasons I find universal models to be better. The first is that the seat cover is very likely to outlast the car itself, or at least the car’s spot as your everyday ride. The second is that car seat covers designed specifically for a given car model’s seat often have the same problems as the original seats themselves. One of the reasons that people buy car seat covers is to correct problems with the original seat, whether those be aesthetic or comfort related, or even if they’re just too hard to keep clean or protect from damage. Getting a seat cover built to the same specifications doesn’t seem like such a good idea in that case. The increased mobility of universal aftermarket seat covers is also a great thing. We live in an increasingly mobile and changeable culture, and you have to be able to move on when the time is right. Of course, if your car has a very particular seat design that won’t match with any of the universal car seat covers out there, there’s nothing wrong with getting one designed specifically for your ride in that case. The best car seat covers don’t usually come cheap–and even if you get an unusually good deal on one of the car seat covers featured in this article, that’s no reason to fail to protect your investment. Caring for your car seat covers is the single best thing you can do to keep your car’s interior looking great and feeling comfortable. Making sure that your car seat covers are properly maintained is also a great way to ensure that the car seats themselves stay fully protected. Installing seat covers can be a real challenge sometimes. However, there are a few quick tips virtually anyone can easily follow to make the installation process go much more smoothly. For example, simply keeping and following the instructions that come with your car seat cover will get you farther than a lot of people get. There’s a reason those instructions are included, folks! Additionally, think about the specific structure of your chosen car seat cover before you go to install it. Different kinds of car seat covers require different special installation considerations. For example, car seat covers that encompass the full seat (by which I mean both the upper backrest portion and the lower seat portion) will require a bit more installation time due to their relative complexity. Seat covers with more cushion, especially those that are meant just for the lower portion of the seat, often need to be aired out after packing before you attempt to install them. This is because the soft internal cushion is often compressed during packing and shipment–letting it expand for a couple of hours will make it much more comfortable once you actually get to sit on it, and it’ll look a whole lot nicer to boot! Cleaning your seat cover is the cornerstone of good car seat cover maintenance. Luckily, most car seat covers are very easy to clean, which is one of the major advantages of purchasing and installing a car seat cover in the first place. Be sure to read the instructions for cleaning and any care labels as well. While most car seat covers are pretty durable, you’d feel silly if you damaged your car seat cover while trying to clean it! Even if your chosen car seat cover can handle the toughest and most abrasive cleaners doesn’t mean you have to use those every time. Start by trying to wipe away stains and spills with a wet cloth. For road dust, pollen, and similar dry messes you can use a standard dust cloth. Only when these simple non-abrasive methods fail should you move on to tougher cleaners. These cleansers do put a lot more wear and tear on the material even if they don’t outright damage it, so don’t use them unless you have to! In addition to using the right cleaners, cleaning your car seat covers frequently is key. This will keep stains from setting in, and will also prevent dust from building up in crevasses. It also keeps your car seat covers looking nice–and looking nice is half the reason you got them, right? You should clean your car seat covers every week of normal use, as well as before and after any long trips. Of course, it should go without saying that you also need to clean your car seat covers any time there’s a spill or similar mess in your car. The faster you can clean the mess, the easier it will be–and the nicer it’ll keep your car. Some of the best car seat covers around today are even machine washable, which greatly enhances their convenience. That being said, spot cleaning while on the road is still important, and keep in mind that you’ll have to remove the seat covers to wash them and then re-install them once they’re completely clean. Generally speaking, though, installations get easier and easier every time! While I definitely prefer machine washable covers, you should also keep in mind that you won’t always have a laundry machine handy when you’re on the road. Protecting your car seat cover from messes and from the elements is a key factor in keeping them looking nice and feeling comfortable. It might feel a bit silly at first to try so hard to protect your seat covers–they’re there, after all, to protect the seats themselves in most cases. However, they’re an investment like anything else, and investments need to be protected. The biggest thing that damages car seat covers is the same thing that damages car seats themselves: exposure to extreme heat and sunlight. Constant exposure to the hot sun, especially over long periods of time, can lead to cracking and warping of car seat covers, especially when it comes to leather and similar materials. Luckily, you can protect your car seat covers by putting a reflective shade in your windshield. You can also park your car in the shade or in the garage whenever possible. In addition to keeping your new car seat covers lasting as long as possible, this will make the ambient temperature of your car a lot healthier and more comfortable. Of course, heat isn’t the only thing in the world that damages car seat covers. Spills and messes are another big one, so be sure to follow my tips in the cleaning section of this article above. However, there are subtle ways that damage can build up, too. For example, sweat and the natural oils in your skin when you sweat can damage car seat covers over time, even really luxurious and durable ones. One way to mitigate the effects of sweat is to be sure to get a car seat cover set with some kind of breathability blended into its construction. Of course, there are other steps you can take, too. Sometimes it’s as simple as putting a towel on the seat when you drive home from the gym. You’d be surprised how much little things like that can add up in terms of overall durability and longevity of car seat covers! If you’ve read this far, you’ve doubtlessly learned a lot about car seat covers: from the details of five of the best car seat covers on the market right now to plenty of information about choosing and caring for car seat covers more generally. I hope this information has helped you find the best car seat cover for you. If you have a great experience with a product featured in this informational article, please let us know in the comments or shoot me a message! Now, for the moment you’ve all been waiting for: my selection for the best car seat covers on the market today after testing over 20 of the most popular and revered products around. Although it was a tough decision, and all of the products featured in this article have some serious merits that I had to carefully weigh against one another, I think it ultimately comes down to overall value. For me, the unit packing the most overall value is the five-seat cover set from Inch Empire. The Inch Empire product impressed me with its middle of the road approach. Instead of creating either the most minimal or the most luxurious product they could, they incorporated elements of both to keep that feeling of luxury while also making sure prices stay low. They also displayed balance and an appreciation for contrasted design elements with their inclusion of both mesh and leather in order to get the maximum benefits of both while mitigating the disadvantages both materials have on their own. While I was most impressed overall with this product, there are a couple more on the list that I want to specifically mention as great choices for particular situations that you might find yourself in while choosing the best car seat cover for your needs. So, without further ado, here are my honorable mentions for the best car seat covers around. One of these may just be the best choice for you personally depending on your situation. My top pick for those of you on a tight budget is definitely the FH Group Flat Cloth Seat Cover. While it’s available at an incredibly low price point, it packs in some key features such as machine washable fabric construction that make it a great value. It’s also the full interior cover option available at the lowest price point, meaning you don’t have to pick and choose the parts of your car you want to cover even if you’re on a shoestring budget. This is also my top choice for those of you who live in hot climates. While its designs do utilize a lot of black, which isn’t always my best recommendation for the really hot weather because of its light and heat absorption properties, the fabric is so breathable as to completely offset this. Of course, the breathability also enhances your comfort on long road trips, and its got cushion to match the air flow. While it does take a bit more time to install than many of its top competitors, it still confidently holds a place as one of the best car seat covers on the market, and at a steal of a price. If you never use your back seat or you’re just not worried about covering it–or if you have specific damage in the front seat that you need to cover up pronto–I’d strongly recommend the Big Ant set of protective cushions. I chose these both because of the maximum value they pack as a set of two as opposed to buying them each individually, and also because of their innovative cushioning and breathability features. Of course, that front pocket is also a nearly indispensable bonus feature. After riding around with these seat covers for a while during the testing phase of my extensive research for this article, I found myself wondering why every single front car seat cover on the market doesn’t feature a similar pocket. I hope this article has helped you reach your own personal conclusion about the best car seat covers for you! If you have any questions, please reach out to me or leave a comment.